On 19th November 2015, Michael Schenker's Temple of Rock played a show at Joy Eslava in Madrid that was filmed for release. That release is now here - "On a mission - Live in madrid", and is available as a DVD, Blu-Ray or CD. 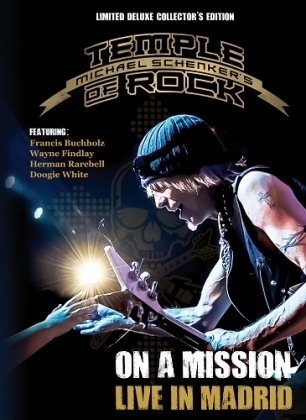 The show covered songs from across Michael Schenker's career, with plenty of material from his Temple of Rock band, sitting alongside classics from UFO, Scorpions and MSG. Anyone who has seen Michael Schenker's Temple of Rock on tour in the last year or so will know just how good they are. They're all very talented musicians and work together well as a band, but it's more than that - after decades of playing, Michael Schenker has finally overcome stage fright and is having fun on stage, and it really shows. The result is that the shows on this tour are probably some of the best that Michael Schenker has played to date. The show kicked off with the UFO classic, "Doctor Doctor" and that was all it took to get the crowd going wild - it's one of those songs that everyone knows and was a perfect choice to start a show with. From there on it's a great show with the newer Temple of Rock material such as "Vigilante man" standing up well alongside the classics from UFO, Scorpions and MSG. Really it's a "best of" type setlist, with highlghts from across the entire length of Michael Schenker's career. The sound quality is excellent, which is as you tend to expect from live DVDs these days, but the video quality can vary on live releases. Happily on this one the video quality is excellent too - it was filmed in 4k, so it's the best picture quality possible. There are occasional bits where the lighting choices mean the video quality isn't perfect (Blue LED lights do tend to cause problems for cameras and video cameras), but they've done an excellent job of minimising those problems. The band are in great form, and Doogie White is a great singer and frontman able to engage the crowd effortlessly and to belt out powerful vocals that sound great. Michael Schenker is no longer to be found at the back of the stage but is right at the front, inches away from the crowd having a great time. A great live DVD - buy it and you won't be disappointed.